Doughboy Park is bounded by Woodside Avenue, 52nd Street and 39th Road, in the Woodside section of Queens. 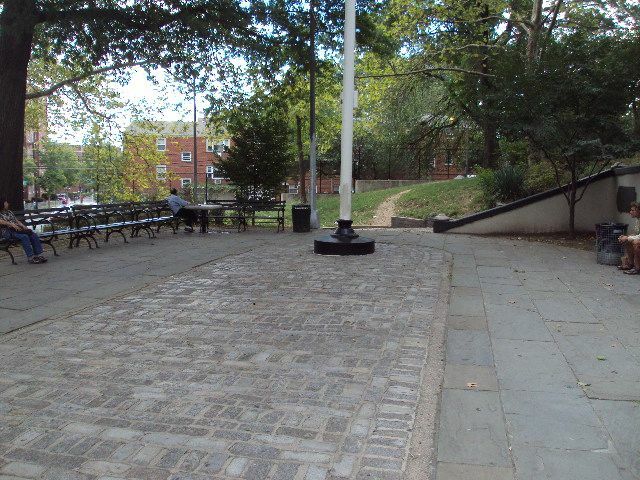 Although the park received its name by local law in 1971, its eponymous monument has stood on the site since 1923. During the first World War, British soldiers referred to their American counterparts as “doughboys” because of the large round buttons on the American uniforms; these buttons reminded the British soldiers of the cakes or biscuits known as doughboys. Statues of American infantry soldiers are similarly called doughboys, and there are bronze doughboys in each of the five boroughs of New York City. The sculptor of the Woodside Doughboy also created a doughboy for the Flanders Field Memorial in De Witt Clinton Park in Manhattan. 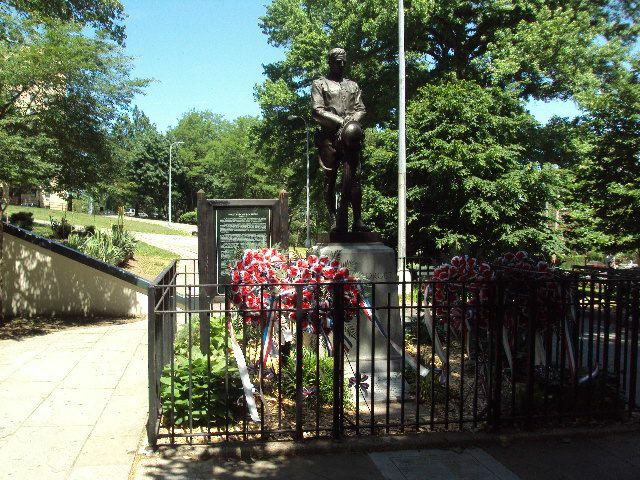 The Woodside Doughboy was erected by the Woodside Community Council in remembrance of the local men and women who served in World War I. Funded by public subscription, the statue was dedicated on Memorial Day, May 30, 1923. The ceremony included music by St. Mary’s Military Band, a rendition of the “Star Spangled Banner” by the children of P.S. 11, the doughboy’s unveiling by Gold Star Relatives, and blessings by ministers from St. Paul’s and St. Sebastian’s Churches. The sculptor, Burt W. Johnson of Flushing, was a student and brother-in-law of renowned artist Augustus St. Gaudens. Johnson portrayed a somber World War I soldier holding his helmet in front and his gun to the side. The sculptor’s health was failing as the piece was being completed, and he supervised the final work from his wheelchair. The bronze statue stands upon a granite pedestal designed by architect C.N. Kent and is inscribed “LEST WE FORGET 1917 1918”. Although the work was originally titled “The Returning Soldier,” it is popularly known as the Woodside Doughboy. Woodside residents remember that even before the statue was erected, local soldiers gathered here at the “mustering ground” before departing to fight in World War I. Ten men who left from this site did not return as they made the supreme sacrifice and gave their lives for their nation. Since the dedication event in 1923, community members have gathered at the monument every Memorial Day for patriotic ceremonies. In 1928 the American Federation of Arts selected the Woodside Doughboy as the best war memorial of its kind in this century. The City of New York acquired this land in 1893 as a play area for P.S. 11. The land was eventually deemed too steep and overgrown for children’s use; it was assigned to Parks in 1957. The site was transformed from a children’s play area to a sitting area for adults, in keeping with the dignity of the statue. Improvements included the addition of drinking fountains, macadam walks, shade trees, and maintenance facilities. In 1990 the beloved Woodside Doughboy received an extensive conservation treatment which included cleaning, repatinating, and treating with a protective wax coating.